Again, because I’m rushing through these trip reports now, there isn’t too much detail, certainly not like in my older Disney Trip Reports that’s for sure, but I plan to be a lot more organised when we’re back home from our next trip! Forewarning, this day is pretty much all food, hence the title! All photos from this day can be found on my Flickr account here if you’d like to see more from Day 11 of Halloween in the Wilderness 2015. Another day at Epcot Food & Wine Festival for us today. Sadly, Liam was finding this quite a boring thing to do, and so he went off and did his own thing for some of the day, before finding us later on. He wasn’t keen on staying for the fireworks and just wanted to go back on the bus to Wilderness Lodge. Whilst I was quite happy for him to do so – he knows his way around Walt Disney World well now – but I didn’t like the idea of us splitting up and not leaving the park together. This means we didn’t watch IllumiNations that evening which was a shame, but we did get to see Boyz II Men on stage which was very cool. We entered Epcot World Showcase via International Gateway, having valet parked at BoardWalk. We wanted to hang out there after being at Epcot all day, so it was the easiest thing for us to do. We caught a Friendship Boat over Crescent Lake, and saw Brer Fox as we entered the park, which was fun, as never seen him before, let alone met him! Our first port of call was the UK Pavilion, where Liam decided he wanted Fish & Chips from Yorkshire County Fish Shop. I grabbed a table outside the Rose & Crown pub while Liam went and lined up for his lunch, and Steve went to get some food from the Ireland Booth. I don’t seem to have a record of the price (or if we used a dining credit) for the fish and chips, but I’m pretty sure we paid out of pocket. 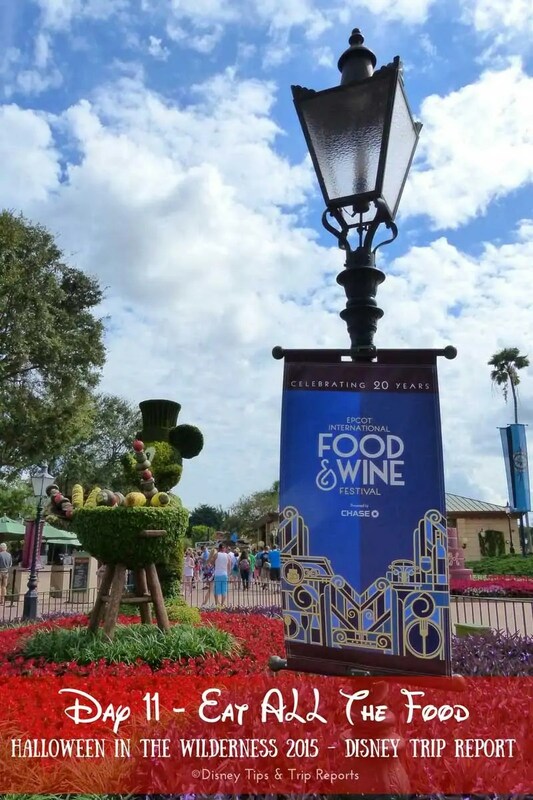 When it comes to the Deluxe Disney Dining Plan at the Epcot International Food & Wine Festival, you can use one snack credit where the symbol is displayed. You can also use one meal credit to purchase 3 snack items in one transaction. During our day we also spied a few more Remy Statues, as part of the pin hunt that was going on during the festival. The audio for this dish was corrupted, so no mini review I’m afraid! In Canada we paid using 1 meal credit, and then moseyed over to the France Pavilion to sample some French cuisine, including escargot…!